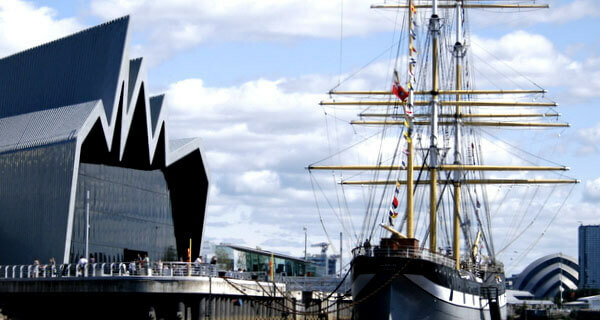 The Riverside Museum in Glasgow is Scotland's museum of transport and travel. The museum contains over 3,000 objects that cover the subject of transportation. It recently replaced the Museum of Transport and has more than doubled the size of the previous collection. One of the exhibits recreates public transportation of a vintage era, including three trams, four locomotive footplates, two subway cars, a bus and a train carriage. One can climb aboard to experience the feeling of a bygone era of travel. Kelvin Street is another popular exhibit; created is a public street from 1895-1930 with other areas of shops that date from the 1930s through the 1980s. The visitor to the exhibits will come away with an insight and knowledge of the history of Glasgow. Included in the exhibits are a cafe from the 1930s, a 1960s garage, and a photo studio from Edwardian times. There is even a tall ship, restored lovingly; it is named the Glenlee and is a Clyde-built vessel. Launched in 1898, the Glenlee holds events and presents activities. A small charge for admission is part of this exhibit. The museum also has a trail, the Riverside Trail outside the museum, where visitors can explore the landscape and points of interest; with 8 stops, images and memories are presented to the viewer. The Riverside Museum also presents guided tours, available when announced. This museum is at Kelvin Harbour , the site of a cross river ferry, a public slipway and powerboat rides. Hours of the Riverside Museum are M-Th and Saturday 10am -5pm and Friday and Sunday 11am-5pm. Last updated by S.J. Golden on 14 December, 2014 in Destinations.